Among Old City Philadelphia Hotels, the Society Hill Sheraton receives our highest recommendation. 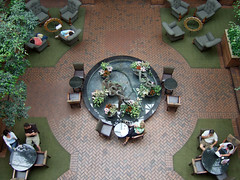 This is an overhead shot of its patio. These are good choices for many Philadelphia attractions. That having been said, you have to negotiate a confusing walk, to get from the Comfort Inn to the Center City Philadelphia grid. This is due to the presence of Interstate 95. If you stay here, you'll have to go over a pedestrian bridge, in order to reconnect with the rest of Center City. But you can learn how to do that, and the Comfort Inn also offers a free van shuttle service to the rest of Center City. The Penn's View Inn is owned by the same proprietor as Ristorante Panorama, a fine Italian establishment. Its home is a 19th-century commercial building, which has been converted into a hotel. You also may have a good view of the Delaware River. The Hyatt Regency offers a spectacular view of the Delaware River at Penn's Landing, and is a great choice for enjoying Old City and Delaware Avenue nightlife. Note: Due to the similarity of the names - don't confuse it with the Society Hill Hotel, which is an independent restaurant/bed and breakfast, nearby. Sheraton also owns two other properties in Center City, near the Convention Center, and at 17th and Race Streets. We highly recommend the Society Hill Sheraton, and you can read a more detailed review of it on the Philadelphia Hotels main page. The Thomas Bond House is a Georgian mansion, originally constructed in 1768, prior to the Revolutionary War. The building is actually owned by Independence National Historical Park, and is now operated as a bed and breakfast with a great location. On Saturday mornings, The Omni Hotel also offers a unique living history option, known as A Taste of History at the Omni Hotel - Breakfast With Betsy. From 9:00 AM to 10:30 AM, guests can dine with Betsy Ross - the 18th-century Philadelphia upholsterer, who - legend has it - sewed the first American flag. If you're interested in learning more about Betsy Ross and the Betsy Ross Flag's origins, take a look at our detailed research page - The Real Betsy Ross - for more on the sources of this legend. Breakfast With Betsy certainly isn't cheap - $35 for an adult, $20 for a child, aged 4-12 - but if it's your first - and possibly only - trip to Philadelphia, it may be worth your while. There is also the Appel Hostels - 32 South Bank Street - a narrow alley running parallel to 2nd and 3rd Streets, between Market and Chestnut Streets. Obviously, a hostel is not a good choice for the majority of visitors searching for Old City Philadelphia hotels. But if you commonly stay in hostels, there is one located right in the middle of Old City. If you'd like to return to the Old City Philadelphia Main Page, please click here. If you'd like to leave Old City Philadelphia Hotels, and return to the Home Page of Enjoying Philadelphia, please click here.